With as much rain that was falling and had fallen one had to be fearless to venture from San Antonio to Fredericksburg for the weekend. However, 15 families with children ranging from 10 months to 17 years made the trip. 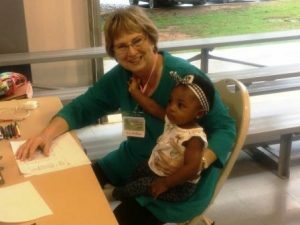 Members of Running the Race Sunday School Class at First Baptist Church hosted Friday evening dinner and provided child care while parents were in counseling sessions with the WTB (Warrior Transition Battalion) Chaplain. Saturday after several more sessions and lunch the families were free to explore, go to movies, the museum, rest, etc. Yes, it was still raining but it didn’t dampen anyone’s spirits. Thinking of February brings up images of Valentines, Chocolate, Roses, Romance, being with your special someone, etc, etc. And being incurable romantics, the WWAN team wanted the couples coming for the retreat to experience ‘it all’!! There were roses and chocolate to greet each couple when they checked into their rooms. The conference room was set up with red linen table cloths and white china with a vase of roses on each table and of course some chocolate scattered around for munching. Red & silver hearts decorated walls and serving tables. 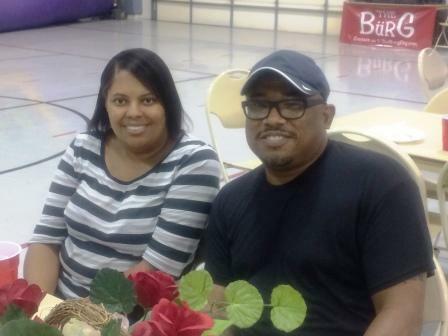 While the couples relaxed around their table getting acquainted with each other, team members served dinner. The hardest decision anyone had to make was which dessert to have. Got the picture? We wanted these couples who were here for some marriage counseling to feel pampered – special. Saturday morning the chaplain held two sessions before lunch. Then Bethany Lutheran Church kept up the Valentine theme! The tables were reset with white linens and more fresh flower center pieces. They had volunteers who, once the stage was set again, served the couples lunch and made it a point to visit with each person there. There was one more counseling session after lunch then the couples were dismissed for their date night. Sunday morning the chaplain held a brief worship service which was actually led by one of the attendees followed by a final session which ended around 11. Judging from comments during the weekend we accomplished our goal – that of making these men and women, some injured, some ill, some just hurting, feel special and for a short time anyway to focus on the positive things in their relationships. And we were honored to be a small part of the process. This Retreat was made possible through donations from generous individuals and businesses in the Fredericksburg community and surrounding areas. We thank each and everyone of you! And special thanks to the following: Fredericksburg Inn & Suites for the special rates, Bethany Lutheran Church for providing the meal and visiting with the couples, The restaurants who allowed us to pay for Saturday nights meals after the fact (Cultures, The Rathskeller, Panda Chinese, Hondo’s, K-Bob’s), Museum of the Pacific War, Fritztown Cinema. More pictures from the event are in the ‘Couples Retreat, February, 2017’ album. Click on “Photos” in the menu at the top of the page to access it. GOD IS GOOD! !